According to an amazing new interpretation of the Bible, a reconciliation of all major religions of the world now does not seem impossible. This is because numbers from the Torah, the Bible, and even the Qur’an validate an exciting new view of the Genesis I Creation that is literal, foundational to the Bible, and scientifically sound. 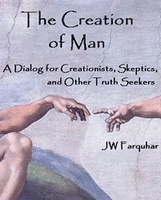 This awakening discovery is revealed in JW Farquhar’s new book The Creation of Man from Mark 7 Publishing. In this troubling world of religious strife and dogmatic rhetoric, there is finally an answer for the Bible’s description of the Creation that works literally, as well as with science, mathematics, reason, and evolution. The Creation of Man prophetically answers the vision of 2300 evenings and mornings in the Book of Daniel by providing an understanding of scripture that renders the reality of mankind’s creation in the image of God (body, soul, spirit) from (evening, morning, day) on the 6th day, therefore receiving a 666 number. It provides, not one, but four calculations, that answer the challenge in Revelation to calculate the number of the beast. This only begins an astonishing walk through the Bible led by numbers that can end the skeptic’s assault on the validity of the Bible and the existence of God. After 777 is counted on the 7th day of the Creation, the numbers 7, 77, and 777 spring to life from scripture again and again to validate this interpretation, and tell a story never before told. See how divine equivocation of numbers reveals the year 2012 December 21st to be 2000+6666+777. Through this amazing Genesis I Window, the hidden math of the entire Bible is revealed. To put it bluntly, you will never regard religion and science as opposite avenues to the truth again. Written as a dialog between a Bible skeptic and an inspired believer this challenging new look at the Genesis I Creation begins with a chance encounter of two acquaintances with opposing views of the Bible. Moe, the inspired believer, recently discovered something in the Bible that he believes is a profound new understanding of God’s six-day Creation. Joe, the skeptic, is not convinced, and demands logical and scientific proof for everything. Nevertheless, Moe battles back with consistent supporting scripture, logic, scientific proofs, and mathematical models. Through this lively and at times humorous dialog the author involves the reader with the skeptic, when many new understandings are offered as puzzles to be solved. The story ends when both participants discover startling new prophecies. New light on the Creation Controversy is shed when Moe, the believer, shows the foundational structure of Genesis I to be a window into the rest of the Bible that reveals new understanding with scientific evidence. The Genesis I Window’s accuracy is proven, over 100 times when numbers from the beginning creation are reconciled to numbers of the Bible, mathematics, science, and even evolution. In this way the God of Time is revealed to be the intelligent designer of the Bible that does not abandon, but includes the traditional Christian view of the Trinity. In this way Biblical Christianity is fulfilled with, and in the name of, God—EVEning-Morning-Light-Day. “This book by JW Farquhar is the biggest threat to Trinitarian Christianity since the Gnostic Gospels”, writes Scott gru-Bell author of Christian Chess and Early Maxims and Aphorisms.